Sometimes you have to let go. Last summer I made the decision to take a sabbatical and move to Hong Kong. Giving up laces, my baby, felt wrong, like I was abandoning the club. It was only after months away I realised that I had a bad case of Founder’s Syndrome. The club did not fall apart in my absence, in fact it grew. Keisha, the new Director focused on quality interactions with our players. In my care, it was a numbers game – the more players, the better, right?! Organisations need new leadership to thrive and it was the right time for me to pass the torch. The need is absolutely still there. This is evidenced by the 247 emails we got to the ‘hello’ inbox this year from players, parents, youth workers, social workers, teachers and others getting in touch asking whether we are taking on new players. We’re also continually getting a constant flow of queries about our ‘off the pitch’ work. Again, it shows the need for youth engagement. Collaboration is a must. The first two years of laces felt like everything was a fight. I was constantly being told no and when I asked why I was never given a reasonable answer. Please can I book an hour on this pitch? No. Why? Because the boys team trains here every night of the week. Please can you give us some funding? No. Unless you get your team to do Chlamydia tests at training and then the NHS will give you £300 as part of a public health campaign. Umm, no thanks. It’s now an official Hackney Laces rules that if a club comes to us asking for help, we give it. This has lead to the birth of our sister club, Limehouse Laces and many other girls and womens’ teams. We’re all in this together so we should be making it easy for each other. And most of the time it’s just a sympathetic ear on the other side of a phone but we support each other in any way we can. Football changes lives. Fact. We saw two of our laces off to America this year on full athletic scholarships, both the first generation in their family to attend university. A football team is also a place to belong. 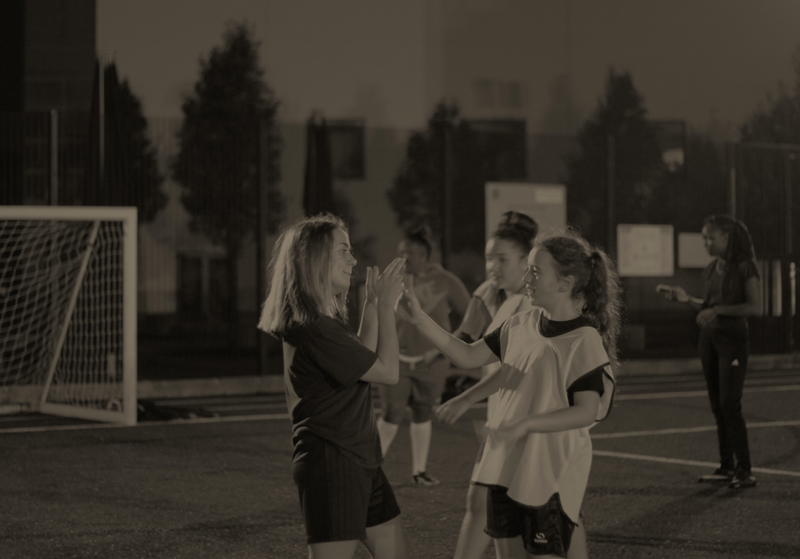 Whether it’s the girl who just moved the UK from Portugal that doesn’t speak English and loves football or the girl who didn’t make the cut for her school team, laces is a place where any girl can come and feel like they belong. I’ll stop here and save you from the novel I could so easily write on this. As always, the club wouldn’t exist without the unrelenting support of our volunteers, members and friends who give so much time and love. And of course the girls who turn up every week and bring their mums, sisters, aunties, cousins and friends. I can’t wait for the year to come and the club turning 5. It’ll be such a big milestone.